Finasteride is a new treatment for androgenetic alopecia (male pattern baldness). It works by inhibiting the 5-alpha reductase enzyme that converts testosterone to dihydrotestorone (DHT). DHT is believed to suppress hair follicle activity so that hair growth is retarded until eventually only a fluff of hair is produced. Finasteride is taken orally at the dosage of 1mg per day. It takes about 6 months before any improvement can be seen and treatment must be continued or the newly grown hairs will fall out. Finasteride cannot be used in women that are or may become pregnant because it may cause genital abnormalities in male babies. In clinical trials comparing finasteride with placebo (dummy pills), a small but slightly higher number of men treated with finasteride noticed loss of libido (sexual drive), erectile dysfunction and smaller volume of sperm. However, all side effects resolved when finasteride was discontinued. Medical treatments of androgenetic alopecia (male pattern baldness) with minoxidil applications or finasteride tablets are effective only as long as the medication is continued and hair will fall out once the medication is stopped. For those who desire a more permanent solution and for those with severe androgenetic alopecia, hair replacement surgery offers an alternative. Hair replacement surgery may be divided into three main types which may be combined to produce the best results. The hair at the back of the head are not affected by androgenetic alopecia and can be relocated to the bald areas. This can be done in two main ways - by removing grafts of hair-bearing skin from the back of the head and inserting them in holes or slits created in the bald area. The grafts differ in size and shape according to the method used. Punch grafts are round and usually contain 10 - 15 hairs, mini-grafts contain 2 - 4 hairs, micro-grafts 1 - 2 hairs, slit-grafts 4 - 10 hairs and strip grafts 30 - 40 hairs. The transplanted grafts retain the characteristics of the hairs at the back of the head and are not affected by the androgenetic alopecia. Hair transplantation is time consuming and several sessions are necessary before the final result can be seen. The new hairline is created and larger grafts are transplanted during the initial session. The spaces between are filled in by smaller grafts during subsequent sessions. The number of grafts transplanted depends on the technique used, varying from 50 up to 700 per session. Care is taken by the doctor to orientate the grafted plugs so that the hairs will grow out in a natural direction. The holes created in the back of the head are closed by stitches. The scars are usually concealed by the hair. Flap surgery involves removing a flap of skin in the bald area and creating a flap of hair-bearing skin that is slid across and stitched into place, leaving one end still attached together with its blood supply. Flap surgery allows large areas of hair to be relocated but is technically more difficult. This is a method to reduce the size of the bald patch rather than replace hair. In scalp reduction, a section of the bald scalp is removed and the surrounding skin is undermined (freed from its deeper attachments) so that the edges can be brought together and stitched. The procedure also gives the forehead a slight lift. Doctors now combine different techniques and use tissue expanders (a balloon-like device that is inflated with saline to cause the skin to expand) to stretch the skin so that larger sections of bald skin can be removed. Hair replacement surgery is usually done under general anaesthesia or local anaesthesia with IV sedation. Cyclosporin (used for treating organ rejection) is sometimes used to treat severe atopic dermatitis, psoriasis, alopecia areata, ichthyosis vulgaris, epidermolysis bullosa acquisita, pyoderma gangrenosum, systemic lupus erythematosus, cutaneous T-cell lymphoma, sarcoidosis.Treatment must be closely supervised and regular blood, urine tests and blood pressure measurements are necessary. Side effects include hypertension, kidney problems, increased hair growth, nausea and loss of appetite, swollen bleeding gums and pins and needles. Solid implants are used to enhance the facial contour, for example to strengthen the jawline or augment the cheek (known medically as malar augmentation) or chin (mentoplasty) or reshape the nose (rhinoplasty. Local anaesthesia with or without sedation or general anaesthesia may be used. In chin augmentation for example, an incision is made along the lower lip or under the chin and the implant is inserted into a pocket created in front of the jaw bone. For cheek implants, an incision is made inside the mouth through the lower eyelid or behind the hairline. Recovery may take 5 - 10 days, depending on the procedure. A variety of implants may be used including bone, cartilage or silicone. Injectable implants, as the name suggests are injected into the skin to puff out wrinkles and raise depressed or sunken scars with sloping edges (scars with well-defined steep edges do not respond well). The material used for implants include collagen purified from cattle skin, a material known as Fibrel, the patient's own fat or a synthetic material known as Gortex but NEVER liquid silicone. Collagen is injected into the dermis and is available as Zyderm I and II and Zyplast. Zyderm collagen is less concentrated and is injected into the upper layers of the dermis. It can be used to correct superficial wrinkles on the forehead, superficial or secondary creases adjacent to nasolabial furrows, forehead creases, vertical creases around the lips which cause lipstick to "bleed" and "crow's feet" on the outside of the eyes. Zyplast collagen is more concentrated and is injected into the mid to lower layers of the dermis. It is used to correct deep wrinkles, nasolabial furrows which run from the corners of the nose to the chin and deep distensible scars (scars that are effaced when stretched) and for lip augmentation (puffing the lips that are thinned and have lost their fullness or pout). Zyplast cannot be used for treating deep forehead wrinkles because there have been reports of it causing skin necrosis there. How long the benefits of an implant lasts depends on the mobility of the region. When used on a relatively immobile areas such as acne scars, the benefits of an implant can last about 6 - 18 months. If the area is very mobile for example deep forehead wrinkles and deep nasolabial furrows, the effect may last only 3 - 12 months. Crows feet can last up to 1 year. Lip augmentation may only last 6 weeks. A skin test has to be performed by injecting a small amount of collagen into the patient's forearm and checking the site at 48 - 72 hours and then at 4 weeks. This helps to detect allergy which occurs in about 3% of individuals. Very occasionally, allergy may still develop in those whose skin tests are negative. There is also concern that collagen might increase the risk of autoimmune disorders (self-allergies) such as lupus erythematosus, polymyositis/dermatomyositis developing. Collagen implants cannot be used in pregnant women, people allergic to lignocaine (the anaesthetic agent that is mixed in with the collagen implant) or beef and in those with a history of autoimmune disorders (self-allergies) such as lupus erythematosus and rheumatoid arthritis. Fibrel contains three components - a powdered gelatin made from porcine (pig) collagen, aminocaproic acid and the patient's own plasma. Plasma is prepared from the patient's own blood which means the doctor will have to draw blood from the patient's arm. This is then centrifuged to separate out the plasma which is then mixed with the gelatin and aminocaproic acid. The mixture is then injected into the dermis. Fibrel is useful for treating deep wrinkles and distensible scars, not the more superficial facial lines. A skin test is still needed to detect allergy even though this is less common than with collagen implants. Fibrel injections tend to be more painful and the procedure takes more time to perform and causes more bruising than collagen implants. It is therefore, not as popular. Fat liposuctioned from the abdomen, buttocks or thighs can be injected into the skin to replace fat lost through ageing, puff up wrinkles and scars and to restore fullness to thin lips. There is no risk of allergy since the fat comes from the same person. The technique is known as autologous fat transplantation. Fat cells are washed and decanted. 20 - 30% of cells will take, the others cells are absorbed. In a modification of this procedure, called autologous collagen transplant, collagen is extracted from the liposuction fat and this is then injected. A US based company performs the extraction of collagen so this technique is not available elsewhere. The benefits are similar to those of cattle collagen except that there is no risk of allergy since the collagen comes from the same person. Gortex is not truly an "injected" implant but is included here for convenience. It is a synthetic implant which has been used for many years in cardiovascular and renal transplant surgery to serve as a channel between the organ and the arterial supply and in surgery to repair hernias. Recently, it has been used as a facial implant to augment or plump up lips and to correct nasolabial furrows which run from the corners of the nose to the chin and forehead furrows. In nasolabial augmentation, for example, the strip of Gortex is introduced with a needle and threaded underneath the skin. The entry and exit points are then closed with absorbable sutures. The implant does not dissolve and stimulates the production of fibrous tissue which further augments the implant. The procedure is usually done under local anaesthesia. It is generally safe. Complications are uncommon and include infection, irritation and rejection. Another similar but newer technique employs SoftForm which comes as a round, spongy tube with a hollow core. It is used in much the same way as Gortex and is quite good for softening the laugh lines around the mouth and the from the corner of the mouth to the chin. These are injections of steroids given directly into swellings such as keloids and inflamed nodules and cysts due to acne vulgaris. The injection is given through a very fine needle and causes a momentary stinging sensation. LASER is an acronym for Light Amplification by Stimulated Emission of Radiation. Lasers use high intensity light of a specific wavelength to cut, burn, coagulate (eg., blood vessels) or fragment (eg., melanin or tattoo pigment). 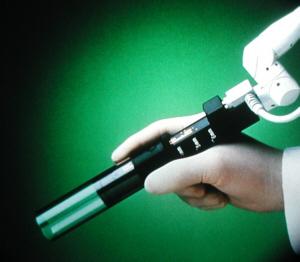 The laser consists of an optical cavity or laser tube containing the active medium (the source of the laser radiation) which may be liquid (as in the flashlamp pumped dye laser), solid (as in the Neodynium-Yttrium-Aluminium-Garnet or NdYag and Alexandrite lasers) or gas (as in the carbon dioxide or CO2 laser), and a power source to excite the atoms in the active medium. In accordance with the laws of photophysics, excited atoms are unstable and will return spontaneously to a more stable lower energy state. When these atoms return to their steady state, they emit photons of energy. Because there are thousands of atoms in the excited state they tend to bump into one another transferring energy to the other. Eventually some of the atoms reach energy levels that exceed the threshold of a partially silvered mirror at one end of the laser tube and are emitted as a high intensity laser beam which can be used to destroy tissues and even cut metals in industries. The carbon dioxide laser can be used for cutting or burning skin growths. More recently, CO2 lasers have been introduced which are capable of producing a very high energy output in short pulses of as little as 1 millisecond. The high energy allows tissue to be destroyed in a shorter time - milliseconds so that less heat is transferred to the surrounding tissue, minimising the risk of scarring. These high energy pulsed lasers are known as superpulsed or ultrapulsed lasers. The superpulsed and ultrapulsed CO2 lasers have now been fitted with computerised scanners which move the laser beam rapidly over the skin so that the time the laser beam dwells on one particular spot is short and even less heat is generated and consequently even less risk of scarring. These lasers can remove layers of skin as little as 50 - 100 microns at a time and can be used in more or less the same way as chemical peels and dermabrasion to treat wrinkles and scars (see laser resurfacing). The Erbium-Yag laser removes even thinner layers of skin (25 microns) and its main use is for laser resurfacing. Carbon dioxide laser (10,600nm) Skin resurfacing. Erbium Yag laser Skin resurfacing. Laser used to treat pigmented problems. The workings of lasers were explained in the previous section. The carbon dioxide and Erbium-Yag lasers can both be used to burn away thin layers of skin. This technique, known as laser resurfacing or "laser peeling" works like chemical peels and dermabrasion. The carbon dioxide laser is more deeply penetrating than the erbium-yag laser which removes 25 micron layers of skin compared to 50 - 100 microns by the carbon dioxide laser. Both these lasers come with computerised scanners which scan the laser beam quickly across the skin and allow the skin to be resurfaced quickly with minimal heating of the skin and consequently, minimal risk of scarring. Unlike dermabrasion, laser resurfacing is not hampered by the spattering of blood and tissue and there is not much bleeding to obscure the view. There is also less post-operative discomfort and faster healing. Laser resurfacing is generally more expensive than chemical peels or dermabrasion because of the high cost of laser machines. The depth of penetration increases with the number of passes the laser beam makes over the skin which allows greater flexibility in treating different severity of scarring and wrinkling. The benefits of laser resurfacing last an estimated 5 - 6 years. As with dermabrasion and chemical peels, deep ice-pick acne scars require prior scar revision using punch excision, punch elevation or punch grafting before laser resurfacing for the best results. Remember also that the laser resurfacing only pushes the age clock back, it doesn't stop it entirely. Treatment may need to be repeated. Improve wrinkles, especially mild to moderate wrinkles and those around the eyes (crow's feet) and mouth. Improve nasolabial furrows and forehead frown lines. Improve scars caused by chickenpox, surgery and trauma and some types of acne scars. This is similar to the preconditioning treatment described on page . It has been observed that healing after laser resurfacing is enhanced when the skin has been pre-treated with tretinoin 0.025 or 0.05% nightly so most doctors put their patients on this regimen for 2 - 4 weeks prior to treatment. If hyperpigmentation is anticipated, especially with skin phototypes III and IV, the doctor may prescribe a lightening cream, as well. Patients with a history of recurrent herpes labialis (cold sores) and those having laser resurfacing around the mouth are usually started on antiviral medicines such as acyclovir or famcyclovir one day before surgery and continued for a total of 7 - 10 days. Depending on the extent of the area being treated, general anaesthesia, local anaesthesia or nerve blocks with or without IV sedation may be used. The face is cleansed with a non-flammable cleanser to remove makeup, oil and dirt. You will then be asked to wear protective goggles. If the area being treated is near the eyes, special eyeshields need to be worn. The wrinkles may be outlined prior to the local anaesthetic injections (because the injections alter their appearance) and the area of treatment delineated. The laser beam is delivered to the skin via a special handpiece which is moved over the treatment area with minimal overlapping. After each pass of the skin, the doctor uses a saline-soaked gauze to wipe away the burnt tissue. A dry gauze is then used to dry the area. Additional passes are made to smoothen out wrinkles and scars, as necessary. The doctor may apply a dressing over the area or he may use an open dressing method involving the application of an antibiotic ointment or vaseline several times a day. It takes approximately 45 minutes to treat the areas around the eyes and mouth or 1 1/2 hour to treat the whole face. Laser resurfacing may be repeated after 6 - 12 months, if necessary. Lasers produce a second degree burn and the wound must be properly cared for in order to prevent complications. Swelling or oedema may be severe especially around the eyes. You should be accompanied by someone if you are not being hospitalised for the first few days. Sleeping with the head slightly elevated for the first 3 - 5 days helps to reduce the swelling. Dry ice packs can be applied (over the dressing, if any) as often as is necessary during the first 3 days and paracetemol can be taken for pain relief. Avoid taking aspirin or aspirin-like drugs. Dressings, if used, are replaced after 24 hours and removed after 48 hours. The skin may be weepy and crusts need to be removed because they form a medium for bacterial growth. Crusts can be removed gently after soaking the skin in cool or tepid water (some doctors advise adding some vinegar) several times a day followed by application of the antibiotic ointment of vaseline. Keep the skin moist at all times as it speeds up the healing process. The newly resurfaced skin is very red and this may last for 2 months or more. The redness can be camouflaged with green foundation, followed by a skin coloured make-up over it. Hydroquinone lightening creams can be resumed after the skin has resurfaced and tretinoin cream 2 - 3 days later. Avoid excessive exposure to the sun and use sunscreens especially when the skin is still red because pigmentation may develop. UV protective sunglasses should also be worn after laser skin resurfacing around the eyes. Avoid strenuous physical activity for at least 5 days and alcohol which may increase blood flow and encourage the development of telangiectasias (broken capillaries). The benefits of laser resurfacing may not be apparent until some 2 - 4 months after surgery so don't despair. Most patients can return to work after the swelling has subsided in 7 - 10 days. Although laser resurfacing is relatively safe, our skin's ability to heal varies so the outcome is not always predictable. However, serious complications are uncommon. Redness is expected and is not really a complication of treatment. It lasts 6 -12 weeks after resurfacing. Green cosmetics are good for camouflaging the redness. Scarring is uncommon but may occur when the procedure is carried out too deeply or if the wound gets infected. Early indications of the possible development of keloids (lumpy scars) include redness, elevation and itching of the skin after it has apparently healed. Early treatment with steroid creams may reduce the severity. The risk of scarring may be increased in patients recently treated with isotretinoin which is why laser resurfacing is normally performed at least 12 - 18 months after completing isotretinoin treatment. Areas such as the upper lip and jawline are more prone to develop scarring. Ectropion (pulling away of the lower eyelid) may occur when laser resurfacing is done too soon after blepharoplasty (eyelid surgery). Hypopigmentation (reduced pigmentation) may occur with deep resurfacing. Hyperpigmentation (increased pigmentation) may develop people with skin phototypes III and IV. It is usually temporary and can be treated with lightening creams as in melasma together with strict avoidance of sunlight (see melasma). It may be avoided with the use of preconditioning treatment. Bacterial infections are rare and can be treated with antibiotics. Candidiasis a fungal infection caused by a yeast-like fungus called Candida albicans is a rare complication. It can be treated with antifungal medicines and creams. Herpes labialis may recur after laser resurfacing which is why patients with a history of herpes labialis are started on anti-herpes medicines 1 day before resurfacing and continued for a total of 7 - 10 days. Milia or tiny whitehead-like cysts may occur transiently. They can be extracted with a number 11 scalpel blade. Pre-treatment of the skin with tretinoin helps to reduce the formation of milia. Acne flares may occur and can usually be treated with topical or oral antibiotics. Minoxidil is a drug used for the treatment of hypertension. One of its side effects is increased hairgrowth which was why its manufacturer, Upjohn formulated a topical form for the treatment of alopecia (hairloss). It is used for the treatment of androgenetic alopecia in both men and women and for alopecia areata. Topical minoxidil is available in 2%, 3% and 5% strengths. To be effective topical minoxidil must be applied twice a day for at least 4 months. Treatment must be continued or the regrown hairs will slowly fall out again. Other than local irritation, topical minoxidil does not cause any serious side effects. Phototherapy uses light for treatment. There are two main forms of phototherapy that are used for treating skin disorders. Special phototherapy units (cabinets) are used and 2 - 3 treatments per week may be necessary for 12 - 24 weeks. UVB phototherapy - using ultraviolet B light. PUVA (psoralen ultraviolet A) phototherapy - using psoralens (chemicals that make the skin sensitive to UVA) . in combination with ultraviolet A (UVA) light. It involves applying the psoralen about 10 minutes before (topical PUVA) or taking the psoralen 2 hours before shining. Severe or resistant eczemas such as atopic dermatitis and hand eczema. Photoageing and increased risk of skin cancers. Regular checkups for skin cancers are necessary. Eye damage such as keratitis or an inflammation of the cornea and cataracts. Special goggles are worn during treatment. Severe eczemas such as atopic dermatitis and hand dermatitis. Mycosis fungoides, a skin lymphoma. Burns ranging from a mild sunburn to blistering (topical and systemic PUVA). Tanned skin locally (topical PUVA) or all over (systemic PUVA). Photoageing and increased risk of skin cancers (systemic PUVA). Regular check up for skin cancers are necessary for those undergoing phototherapy. Skin ageing and increased risk of skin cancers (systemic PUVA). Regular checkups for skin cancers are necessary. Eye problems such as keratitis or an inflammation of the cornea and cataracts (systemic PUVA). Special goggles are worn during treatment. Follow the doctors instructions carefully. Phototherapy increases the risk of photoageing (sun induced ageing) and skin cancers. Protect the skin against natural sunlight and use sunscreens religiously. Wear wrap around sunglasses that protect against UVA and UVB. Inform your doctor if you have sensitivity to the sun or are taking medications, some of which may increase the sensitivity to sunlight. Tell your doctor if you are pregnant. Systemic PUVA is generally not used in pregnant women even though there is no evidence that PUVA affects pregnancy. Retinoids refer to drugs derived from vitamin A. There can be classified into topical and oral retinoids. Tretinoin cream and lotions - used for treating acne vulgaris (pimples) or photoageing. Adapolene gel - used for treating acne vulgaris. Use at night because retinoids increase the sensitivity to sunburn. Use more frequently only is instructed by your doctor. Adopolene does not seem to increase the sensitivity to the sun. Apply to dry skin. Wait at least 30 minutes after washing. Avoid the eyes and mouth. Use sunscreens during the day. Irritation may occur and acne may get worse during the first 6 weeks of treatment with tretinoin (less common with adapolene) but the skin usually gets used to it. You may use moisturisers if the skin is very dry but choose an oil-free or non-comedogenic one if you have oily skin or acne vulgaris. Use mild cleansers and avoid abrasive scrubs. Seek you doctor's advice if you are uncertain about anything. Isotretinoin (Roaccutane or Accutaine) - a very effective medication for nodular of cystic acne vulgaris. Acitretin (Neo-Tigason) - used for treating disorders of keratinisation such as psoriasis, Darier's disease, pityriasis rubra pilaris, etc. Physical sunscreens (sunblocks) - Sunblocks block everything out and use opaque particles such as zinc oxide and titanium oxide. These used to be messy to use but many modern sunblocks now use micronised zinc and titanium oxide which are do not leave such an obvious trace on the skin. Chemical sunscreens - These use chemicals that absorb light energy and dissipate in an another form which is less harmful. Cinnamates such as potassium cinnamate, diethanolamine-p-methoxy cinnamate, octyl-p-methoxy cinnamate. Benzophenones which filter only short-wave UVA, for example oxybenzone, dioxybenzone and sulisobenzone. Dibenzoyl methanes which filters both short and longwave UVA, for example butylmethoxydibenzoylmethane (Parsol 1789 or avobenzone), Parsol 8020 and Eusolex 8020.